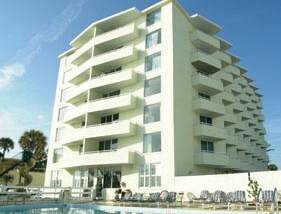 LocationThis hotel is situated in Daytona Beach, Florida.FacilitiesThe hotel features 54 accommodation units. A lift provides easy access to the upper floors. Services and facilities at the hotel include internet access, wireless internet access, a playroom and a laundry. Guests can use the parking spaces if required.RoomsAll rooms feature air conditioning, central heating, a fan and a bathroom. Guests will also find a balcony in most rooms. The carpeted accommodation units feature separate bedrooms, a double bed or a king-size bed. Cots are available for children. All accommodation units feature a kitchenette with a fridge, a microwave and tea and coffee making equipment. An ironing set is also available to guests. Convenient features include internet access, a telephone, a TV, a radio, a DVD player and wireless internet access. In each of the bathrooms, guests will find a shower, a bathtub and a hairdryer.Sports/EntertainmentA refreshing dip in the indoor or outdoor pool can be pleasantly cooling on hot days. The hot tub offers revitalisation. A gym is among the leisure options available to guests. PaymentThe following credit cards are accepted at the hotel: American Express, VISA, Diners Club and MasterCard.